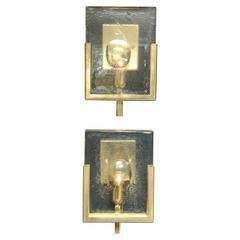 Pair of rare stamped brass linear sconces with white glass globes. The epitome of midcentury chicness. Wired for U.S. standards. Each light holds a medium base bulb. This pair of sconces is on display at the 1stdibs Gallery at the New York Design Center. Pair of hand-hammered brass "leaf" shape sconces by Tommaso Barbi designed in Italy, circa 1970s. Pair of Italian sconces made of Murano glass structure. Light bulb made of matte glass sphere. Finials made of brass. Amazing pair of brass and white painted wall lights, nice conditions overall, fully restored electrical parts. They work with both 110 and 220 Volt.